Store the knife separately in a cutlery tray or knife block. 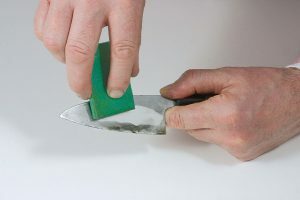 We advise against magnetic holders, as these magnetise the blade and thus hamper sharpening (abrasive particles remain stuck on the blade during sharpening). Never clean high-quality knives in the dishwasher, even if they have »rustproof« blades! The atmosphere of high temperatures and salty water leads to intercrystalline corrosion and therefore destroys the blade. Even today, (not rustproof) carbon steel is still the blade material with the finest structure and highest possible sharpness. Maintain these knives by oiling them regularly with odourless, food-safe camellia oil (No. 705280). A black oxidised coating on the surface or light surface rust can be removed with the rust eraser (No. 711161). With a little water, it actually erases the oxide coating. Chromium polish, e.g. Gundel-Putz Polish and Whetting Paste (No. 705262) can also be used.